This Iranian film won the Academy Award in 2017 for Best Foreign Feature, and it was well-deserved. I would have gone with A Man Called Ove if I had a vote, but it was a strong year for the category, although it’s a bit ridiculous that only five movies from the entire non-English-speaking world get to compete for the award. The Oscars are a bit more pointless than I would have believed when I was younger, but that doesn’t mean that we can’t enjoy them, or that the films that win shouldn’t be given their due respect. This movie won because it is powerful and well-made, a slow-burning drama that will kick you in the teeth at the end. Emad and Rana are a married couple living in Tehran; he’s a teacher and she stays at home. They also both participate in a theatre which is currently putting on The Death of a Salesman, under a bit of censure from the government, but that’s to be expected. When nearby construction damages their apartment building, the couple is forced to temporarily relocate, searching the city for a likely apartment. A man from their troupe gets them into a vacant space, but the previous tenant was a woman of ill repute, something he doesn’t share with his prospective renters. One evening, a man comes to call, not knowing that the woman he expects to find has moved. He strikes Rana over the head and flees, setting off a series of events that will destroy her & Emad’s happiness, and will propel him toward revenge. The Salesman really is the definition of a slow burn, the only real action coming off screen when Rana is attacked. The story takes its time to develop, the situation slowly boils, and, like the frog in the parable, we don’t jump out because we don’t at first notice what’s happening. Once we do, we’re in deep, and the plot has hooked us. By the end, which is incredible, we’ve become invested in the characters, and their life is so realistic that it’s hard to separate fact from fiction. 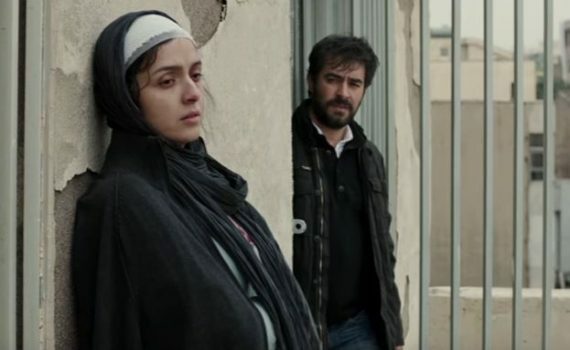 Farhadi is a very respected director, and this film show’s why; he was almost a conductor of an orchestra, slowly building to a climax, more than a filmmaker using standard tricks. I don’t exactly understand the parallels between what was happening and the show the characters were putting on; I’ve read the screenplay, but I don’t remember enough about it to make the metaphoric connections. If you do, maybe you’ll pick up on even more, but the story is intense enough without anything extra. The actors were great, the tension mounts bit by bit, by the end I was enmeshed, and the payoff is worth the work it takes to watch two hours of subtitled angst. Take a chance on this one if this isn’t your genre but you’re curious; it’s a well-made film all around.